Let’s get right to the point, silverfish are creepy insects. They tend to appear in moist areas and thrive in damp and dark environments such as basements, sheds, attics, bathrooms, and kitchens where they are attracted to paper and damp clothing. There is nothing that wigs me out more than seeing a silverfish scurry across the floor or the counter. Although they are creepy, the good news is that they are harmless to humans. Silverfish like sugar and starches and feed on paper and clothing, often causing mass destruction. Glue in books, silk, linen, cellulose, shampoos and dead insects are all food sources. Silverfish are tricky and can get into tight spots – they have even been found in packages of food not yet opened. You can even bring silverfish inside without knowing it on boxes, containers etc. Silverfish can also invade a home through small cracks in foundations, torn screens, and gaps in windows and walls. Silverfish are small tear-shaped bugs with very long antennae and three bristles. They are brown-grey, or silver and do not have wings. They move very quickly using their three pairs of legs. Baby silverfish are white at first but turn quickly to brownish grey. Female silverfish lay between 2-20 eggs in a cluster in some discreet place such as small holes, crevices etc. These oval transparent capsules house small grey nymphs. Silverfish eggs hatch from 19 to 60 days after being laid – depending on humidity. If it is humid, they hatch faster. From the time an egg is laid, silverfish take between three to four months to mature. A silverfish generally live between two and three years. Do I have an infestation? Perhaps you have seen a few silverfish scurrying about in your home. You might see yellow spots on paper, eggs and small black feces. This most likely indicates that you have an infestation of some degree. It is important to get on top of this so that the bugs do not overrun your home. 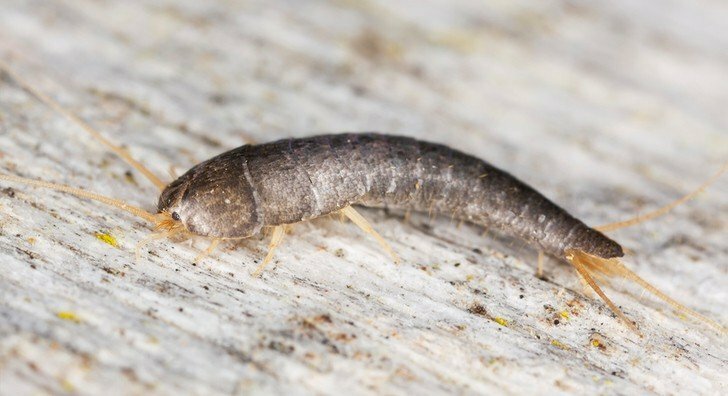 Before we dig into how to get rid of silverfish in your home naturally, let’s go over a few things that you can do to keep an infestation from happening in the first place. It is first and foremost important to keep your home clean and free from food residues and such etc. Daily and weekly cleaning will not give silverfish a reason to hang around. To help prevent infestation, spread some baking soda on the floor and vacuum up eggs. Be sure to keep dust off of books, and store papers in dry places. Keep your bathroom floor mopped because silverfish love to munch on dead skin cells which make up about 40% of house dust. A homemade cleaner made with equal parts vinegar and water, plus a squirt of natural dish soap (not Castile soap) and 10 drops of peppermint oil and eucalyptus oil will help repel silverfish. If your sink or pipes are leaking they will be a silverfish magnet. Check pipes, faucets etc on a monthly basis to be sure they are not leaking. If your home or basement is damp, use a dehumidifier to keep the moisture down. Make sure that food containers and packages are closed tightly and all opened food is kept in a sealed container. Get rid of old boxes and piles of magazines and paper. Store books, papers, clothes, photo albums, and magazines in a sealed plastic container. Check regularly and fill cracks in floorboards, trim, windows, doors and walls. Diatomaceous earth is composed of the fossilized remains of tiny aquatic creatures called diatoms. The skeletons of these creatures are made of a natural substance called silica. Diatoms accumulated in the sediment of streams, lakes, oceans, and rivers over a long period of time. Using diatomaceous earth to eradicate insects in the home and garden has become a popular alternative to toxic insecticides. Because it is not poisonous, diatomaceous earth does not need to be ingested by the silverfish to be effective. It causes insects to dry out and die by absorbing oils and fats from the cuticle of the insect’s exoskeleton. It has very sharp edges and remains effective as long as it stays dry and undisturbed. To use diatomaceous earth in your battle against silverfish, sprinkle some around floorboards and in areas where you have seen silverfish moving. Make a mixture containing equal parts water, baking soda and honey. Put the mixture on small pieces of strong cardboard and place the paper in places you have seen silverfish. This method works really great for tight spots such as behind books on a bookshelf. Cover a tall glass with twine and put some dry oatmeal inside to attract silverfish. They can get into the jar but not back out. Check your trap daily, empty and start again. Salt works in much the same way as diatomaceous earth. Silverfish like to eat salt but it causes dehydration. They also take salt back for the silverfish family to enjoy. Sprinkle salt liberally and often in areas where you see silverfish. The smell of cloves is repulsive to silverfish. Cloves contain a substance called Eugenol which acts as a natural insecticide. The application is simple. Place a whole clove in each place where silverfish are frequently seen. To use essential oils, mix 20 drops of oil with vodka in a glass spray bottle. Spray the solution in dark and damp areas and near cracks. Spray as necessary to keep fragrance strong. Place citrus peels in dark and damp places to repel silverfish. Replace with new peels a couple times a week. Just like citrus peels, silverfish can’t stand the aroma of cucumber peels. Place them in damp and dark areas and refresh weekly. Place cinnamon sticks in cupboards, behind bookcases and other areas where silverfish hang out. These easy-to-make DIY sachets will naturally deter silverfish. Wrap ingredients in a piece of cheesecloth and tie. Place sachets in dark places, under sinks, in boxes, in closets, in drawers, behind books and anywhere you wish to repel silverfish. Don’t want to make your own sachets? Then you can purchase ready-made pest repelling lavender sachets from here. As strange it may sound, this natural silverfish repellent actually works. Mix mashed potatoes with alum powder. Shape into balls and place on cardboard. Put the cardboard pieces throughout your home. Cedar oil is an ingredient in many insecticides. The upside of using cedar shavings for the control of silverfish is that they make your home smell amazing. Place shavings in infested areas or use cedar oil spray for hard surfaces. Boric acid is a naturally occurring mineral that is poisonous to silverfish. To use boric acid, place a little on a cracker and places where silverfish hide.